Dendritic cells (DC) that are stimulated with inflammatory mediators can maturate and migrate from nonlymphoid tissues to lymphoid organs to initiate T cell-mediated immune responses. This migratory step is closely related to the maturation of the DC. In an attempt to identify chemokine receptors that might influence migration and are selectively expressed in mature DC, we have discovered that the chemokine receptor, EBI1/CCR7, is strikingly up-regulated upon maturation in three distinct culture systems: 1) mouse bone marrow-derived DC, 2) mouse epidermal Langerhans cells, and 3) human monocyte-derived DC. The EBI1/CCR7 expressed in mature DC is functional because ELC/MIP-3β, recently identified as a ligand of EBI1/CCR7, induces a rise in intracellular free calcium concentrations and directional migration of human monocyte-derived mature DC (HLA-DRhigh, CD1alow, CD14−, CD25+, CD83+, and CD86high) in a dose-dependent manner, but not of immature DC (HLA-DRlow, CD1ahigh, CD14−, CD25−, CD83−, and CD86−). In contrast, macrophage inflammatory protein-1α (MIP-1α), monocyte chemotactic protein-3 (MCP-3), and RANTES are active on immature DC but not on mature DC. Thus, it seems likely that MIP-1α, MCP-3, and RANTES can mediate the migration of immature DC located in peripheral sites, whereas ELC/MIP-3β can direct the migration of Ag-carrying DC from peripheral inflammatory sites, where DC are stimulated to up-regulate the expression of EBI1/CCR7, to lymphoid organs. It is postulated that different chemokines and chemokine receptors are involved in DC migration in vivo, depending on the maturation state of DC. Dendritic cells (DC)2 are specialized APC for T cell-mediated immune responses (1, 2, 3). DC originate from hemopoietic stem cells and subsequently migrate into many sites of a body (1, 2, 3, 4). DC found in nonlymphoid organs are immature cells with high capacities of Ag capture and processing, and yet low ability to stimulate naive T cells. Inflammatory mediators, i.e., bacterial and viral products, and locally produced cytokines, promote the maturation and the migration of DC out of nonlymphoid tissues into secondary lymphoid organs through the afferent lymphatics. After mature DC reach the T cell areas of lymphoid organs and express the MHC and adhesion/costimulatory molecules required for T cell stimulation, the DC activate recirculating naive T cells in an Ag-specific manner (1, 2, 3, 5). Thus, the migration of homing DC should be one of the critical steps of immune responses. There is accumulating evidence that chemokines play an important role in trafficking of DC (6, 7, 8). Chemokines are a large family of small, structurally related cytokines that have four cysteines in highly conserved positions (9, 10, 11, 12). About 30 human chemokines are identified to date and grouped into two major subfamilies, CXC chemokines and CC chemokines, on the basis of the location of the first two cysteines (10, 11, 12). Chemokines have multiple effects and control not only the directed recruitment of the leukocytes, but also HIV infection (13, 14, 15), angiogenesis (16), and hemopoiesis (17, 18). The specific effects of chemokines on target cells are mediated through the seven transmembrane, G protein-coupled receptors (GPCR), which have unique structural features different from other GPCR (19, 20). Cloning strategies using the homologous region of chemokine receptor families have identified many chemokine receptors, including orphan receptors whose natural ligands are unknown. Recently, several novel chemokines have been discovered from expressed sequence tag databases based on the structural feature of chemokine families, and identified as ligands for these orphan receptors (21, 22, 23). Previous reports showed that CC chemokines like MIP-1α, MCP-3, and RANTES are involved in migration of human cultured DC in vitro, and that DC differ from other leukocytes in the patterns of response to chemokines (6, 7, 8). However, the DC that were used in these studies were mainly immature DC. In this study, we focused on chemokine receptors selectively expressed in mature DC, because migration of DC is closely associated with their maturation (5). 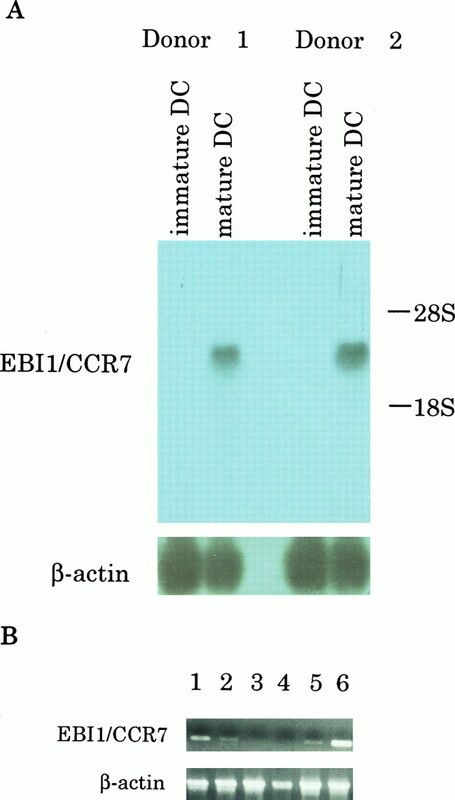 Here, we report that the chemokine receptor, EBI1/CCR7, has a unique expression pattern in DC. EBI1/CCR7 was previously reported as an orphan GPCR induced by EBV infection in B cells and expressed on activated T and B cells (24, 25, 26). Recently, the ligand of EBI1/CCR7 was identified as a novel CC chemokine designated as ELC/MIP-3β (21). Here we show that the expression of EBI1/CCR7 is strikingly up-regulated upon maturation of three distinct DC populations: 1) mouse bone marrow-derived DC, 2) mouse epidermal Langerhans cells (LC), and 3) human monocyte-derived DC. Furthermore, we demonstrate that ELC/MIP-3β selectively induces increases in intracellular free Ca2+ concentration ([Ca2+]i) and directional migration of mature DC but not of immature DC. Interestingly, the expression of ELC/MIP-3β is mainly restricted to lymphoid organs such as thymus, spleen, lymph node, and appendix (21, 27). It is tempting to speculate that EBI1/CCR7 might be involved in DC migration from periphery to lymphoid organs after they are stimulated with maturation-inducing inflammatory mediators. Female BALB/C mice, 7 to 8 wk old, were purchased from Charles River Japan (Kanagawa, Japan). Recombinant human MIP-1α, MCP-3, and RANTES were purchased from Pepro Tech (Rocky Hill, NJ). Mouse rTNF-α and human rIL-4 were purchased from Genzyme (Cambridge, MA). Purified human and mouse rGM-CSF and purified human TGF-β1 were produced in a laboratory of Kirin Brewery (Gunma, Japan). The culture medium was RPMI 1640 (Life Technologies, Gaithersburg, MD) supplemented with 10% FCS, 10 mM HEPES, 50 μM 2-ME, and 20 μg/ml gentamicin. Mouse bone marrow-derived DC were obtained as described previously (28, 29). In brief, red cell- and FcR+ cell-depleted bone marrow cells were cultured in medium supplemented with GM-CSF (10 ng/ml) and TGF-β1 (10 ng/ml) for 6 days. To obtain an immature DC-enriched population (D6 BM-DC), FcR− cells were recovered after panning on a human IgG (Organon Teknika, Durham, NC)-coated Petri dish. D6 BM-DC were cultured for an additional 2 days with GM-CSF (10 ng/ml) and TNF-α (250 U/ml) to allow further maturation (D8 BM-DC). From 50 to 60% of D8 BM-DC was mature DC with phenotype of I-Ahigh/B7-2high as assessed by analyses on FACScan (Becton Dickinson, San Jose, CA) double stained with anti-mouse I-Ad mAb (AMS-32.1) and anti-mouse B7-2 mAb (GL1) purchased from PharMingen (San Diego, CA). Epidermal sheets were prepared by treating the split skin sheets of mouse ears with 1% trypsin (Cosmo Bio, Tokyo, Japan). Epidermal sheets were floated in Hanks’ medium supplemented with 10% FCS and agitated gently by shaking for 1 min. The medium containing single cells (freshly isolated epidermal cells) from epidermis was recovered. Freshly isolated epidermal cells were cultured for 3 days and floating cells were recovered (cultured epidermal cells). Human DC derived from monocytes were prepared as described previously (30, 31). Peripheral blood was obtained from normal donors and PBMCs were prepared by sedimentation in Ficoll-Paque PLUS (Pharmacia Biotech, Uppsala, Sweden). T cell-depleted PBMCs by neuraminidase-treated SRBC-rossetting and highly purified CD14+ cells by magnetic cell sorting with CD14 microbeads (Miltenyi Biotec, Sunnyvale, CA) also were prepared. These cells were cultured with GM-CSF (50 ng/ml) and IL-4 (100 ng/ml) for 5 to 7 days (immature DC). Immature DC were further stimulated with 50% monocyte-conditioned medium (MCM) prepared by 24-h culture of human IgG panned cells for 3 to 4 days or with LPS (10 ng/ml) for 24 h to obtain mature DC. The phenotype of immature and mature DC were assessed by analyses on FACScan stained with mAbs against HLA-DR, CD1a (Leu-6), and CD14 (Leu-M3) from Becton Dickinson, CD25 (M-A251) and CD86 (IT2.2) from PharMingen, and CD83 (HB15) from Immunotech (Marseille, France). Total RNA was isolated from the mouse D8 BM-DC using ISOGEN (Nippon Gene, Tokyo, Japan). First-strand cDNA was synthesized from 5 μg total RNA using an oligo(dT) primer with a SuperScript Preamplification System (Life Technologies) following the manufacturer’s recommended protocol. Two microliters of this cDNA was subjected to 40 cycles of PCR in 100 μl reaction mixture containing 0.2 mM each of dNTPs, 2.5 U of TaKaRa Taq (Takara, Kyoto, Japan), 0.55 μg of Taq Start Ab (Clontech, Palo Alto, CA), 1× buffer supplied with the polymerase, and 1 μM of degenerate oligonucleotide primer pair. They were designed based on the conserved sequence of previously known chemokine receptors. Conditions of the PCR were changed depending on each primer pair used. Resultant PCR products were gel purified and cloned into pCR2.1 (Invitrogen, San Diego, CA). Individual clones were sequenced on an Applied Biosystems (Foster City, CA) model 377 DNA sequencer using T3 and T7 primers and analyzed BLAST (National Center for Biotechnology Information, Bethesda, MD). For RT-PCR analyses, cells labeled with appropriate mAbs were sorted on FACS Vantage (Becton Dickinson) using the following criteria to obtain pure cell populations. Mouse B cells (B220+), macrophages (Mac-1+), and granulocytes (Gr-1+) were obtained from bone marrow cells. Mouse T cells (CD4+/CD8− and CD4−/CD8+) were obtained from spleen cells. Mouse immature DC (I-Aintermediate/B7-2low) and mature DC (I-Ahigh/B72high) were obtained from D6 BM-DC and D8 BM-DC, respectively. Mouse immature LC and mature LC were sorted as I-A+ cells from freshly isolated and cultured epidermal cells, respectively. Human B cells, T cells, monocytes, and granulocytes were sorted as CD19+, CD3+, CD14+, and CD66b+ from PBL, respectively. Human immature DC and mature DC were sorted as HLA-DRlow/CD86− and HLA-DRhigh/CD86high cells from cultured monocytes, respectively. In Northern blot analysis, 20 μg of total RNA prepared from human immature DC (HLA-DRlow, CD1ahigh, CD14−, CD25−, CD83−, and CD86−)-enriched cells and mature DC (HLA-DRhigh, CD1alow, CD14−, CD25+, CD83+, and CD86high)-enriched cells (>95% pure as assessed by analyses on FACScan) derived from highly purified CD14+ cells were fractionated on denaturing formaldehyde-agarose gel, transferred to a Hybond N+ (Amersham, Les Ulis, France), and immobilized by baking at 80°C for 2 h. Blots were hybridized with 32P-labeled cDNA probes encoding EBI1/CCR7 and β-actin as a control of RNA loading at 68°C for 1 h in ExpressHyb Hybridization Solution (Clontech) and washed with 2× SSC/0.1% SDS at room temperature for 1 h and followed by 0.1× SSC/0.1% SDS at 63°C for 1 h. In RT-PCR analyses, total RNA isolated from 1 × 105 FACS-purified cells was used for first-strand cDNA syntheses. The cDNA was subjected to 35 cycles of PCR (96°C for 1 min, 58°C for 20 s, and 72°C for 1 min) with specific primers for EBI1/CCR7 ((mouse forward: 5′-ACAGCGGCCTCCAGAAGAACAGCGG, mouse reverse: 5′-TGACGTCATAGGCAATGTTGAGCTG), (human forward: 5′-TCCTTCTCATCAGCAAGCTGTC, human reverse: 5′-GAGGCAGCCCAGGTCCTTGAAG)). As a control, specific primers for β-actin purchased from Clontech was used. In order to detect and purify the expressed product, Flag tag (DYKDDDDK) (32) was fused at the C terminus of ELC/MIP-3β with a four-amino acid linker (SRGG). The cDNA encoding ELC/MIP-3β-Flag was cloned by RT-PCR from human thymus QUICK-Clone cDNA (Clontech) using ELC/MIP-3β-modified primers with restriction enzyme sites based on the published sequence (21, 27). The cDNA was cloned into a pSMT201 mammalian cell expression vector (33) and the sequence of the ELC/MIP-3β-Flag cDNA was verified prior to transfection. Plasmid DNA was transfected by a DEAE-dextran method (34). Briefly, COS 1 cells were seeded at a density of 4 × 106 in a 225-cm2 collagen-coated flask in DMEM with 10% FCS. After 24 h of incubation, cells were washed with DMEM and then transfected with 50 μg of the plasmid DNA in DMEM with 10% NU-SERUM-IV culture supplement (Becton Dickinson), 400 μg/ml DEAE-dextran (Pharmacia), and 100 μM chloroquine (Sigma, St. Louis, MO) for 4 h. After washing cells with DMEM, cells were cultured for 72 h in 50 ml DMEM supplemented with 0.2% BSA, 5 μg/ml bovine insulin, 5 μg/ml human transferrin, 20 μM monoethanolamine, and 25 μM sodium selentite. Culture supernatants of transfected cells were clarified by filtration, concentrated 10-fold using Ultrafree-15 centrifugal filter device Biomax-5k (Millipore, Milford, MA), and purified with anti-Flag M2 Affinity gel (Eastman Kodak, New Haven, CT) as recommended by the supplier. Eluted fractions were neutralized by 1/10 volume of 1 M Tris-HCl (pH 8.0). The purified product was run on a 15/25 gradient gel and transferred to a polyvinylidene difluoride membrane (Millipore). The membrane was blocked with Block-Ace (Dainippon, Osaka, Japan) in TBST (100 mM Tris-HCl (pH7.4), 150 mM NaCl, and 0.1% Tween-20) and incubated with anti-Flag mAb (Eastman Kodak) as the primary mAb and horseradish peroxidase-conjugated goat-anti mouse IgG to a secondary mAb. The Flag-tagged proteins were detected using an enzymatic chemiluminescence kit (ECL Western Blotting Reagent, Amersham). As a control, mock pSMT201-transfected COS1 culture supernatant was processed exactly the same way as described above. Cells were suspended at 5 × 105 cells/ml in recording buffer (5 mM HEPES buffer, pH 7.4 containing 140 mM NaCl, 4 mM KCl, 1.25 mM CaCl2, 1 mM MgCl2, 1 mM NaHPO4, 11 mM glucose, and 0.1% BSA) and loaded with 5 mM fura-2/AM (Dojindo, Kumamoto, Japan) at room temperature for 45 min in the dark. Cells were washed twice, resuspended at 1 to 2 × 105 cells/ml in recording buffer, and 1 ml of cell suspension was used for each assay. Fura-2 fluorescence changes of the freshly loaded cells responding to chemokines were monitored by CAF-110 Intracellar Calcium Measurement System (JASCO, Tokyo, Japan) set at 340 nm excitation and 380 nm and 505 nm emission wavelength. The data are presented as the relative ratio of fluorescence at 340/380 nm. The modified method reported by Quin et al. (35) was employed for chemotaxis assay. Assay medium was RPMI 1640 supplemented with 0.1% BSA, 10 mM HEPES, 50 μM 2-ME, and 20 μg/ml gentamicin. Chemokines diluted with assay medium were added to 24-well tissue culture plates (Corning Costar, Cambridge, MA) in a final volume of 600 μl. Transwell culture inserts (Corning Costar) with 6.5-mm diameter and 5.0-μm pore size were inserted into each well and human immature and mature DC (2 × 105 cells for each) derived from highly purified CD14+ cells were added to the top chamber in a final volume of 200 μl. The plate was incubated at 37°C in 5% CO2 for 3 h. The cells migrating to the bottom chamber were recovered and stained with anti-CD86 mAb. A 200-μl aliquot of the total cell suspension was applied to FACScan by acquiring events for a set time period of 60 s and analyzed by differentially counting CD86− cells and CD86+ cells as immature and mature DC, respectively. To identify chemokine receptors in mature DC, we employed a RT-PCR method with several degenerate oligonucleotide primers designed based on the amino acid sequence motifs conserved in the chemokine receptor family. For this purpose, RNA was prepared from mouse D8 BM-DC enriched with mature DC (50 to 60% pure as assessed by high level expression of both I-A and B7-2), and reverse transcribed to cDNA. Each PCR product with appropriate molecular size predicted by the primer pairs was gel purified, cloned into PCR2.1, and analyzed. The majority of the resultant clones were previously known chemokine receptors and orphan putative chemokine receptors. We selected some of them, particularly the ones that have not been reported to be expressed in DC, to further analyze the expression pattern between mouse bone marrow-derived immature and mature DC. Each population was purified by sorting on FACS Vantage as described in Materials and Methods and analyzed by RT-PCR using specific primers for each of the genes. Based on the previous reports, immature DC were sorted as I-Aintermediate and B7-2low population from D6 BM-DC, i.e., FcR− cells derived from bone marrow cells cultured with GM-CSF and TGF-β1 (29). As shown in Figure 1⇓A, we discovered that EBI1 was selectively expressed in mature DC but not in immature DC. RT-PCR analyses of EBI1 transcripts in sorted mouse bone marrow-derived DC, epidermal LC, and other leukocytes. Top, EBI1; bottom, β-actin control. A, Expression pattern of EBI1 in mouse DC. Lane 1, bone marrow-derived immature DC sorted as I-Aintermediate and B7-2low; lane 2, bone marrow-derived mature DC sorted as I-Ahigh and B7-2high; lane 3, immature LC sorted as I-A+ cells from freshly isolated epidermal cells; lane 4, mature LC sorted as I-A+ cells from cultured epidermal cells. B, Expression pattern of EBI1 in mouse leukocytes sorted by appropriate mAb shown in parentheses. Lane 1, macrophage (Mac-1+); lane 2, granulocyte (Gr-1+); lane 3, B cell (B220+); lane 4, T cell (CD4+/CD8−); lane 5, T cell (CD4−/CD8+). In the next experiment, epidermal LC were used to confirm the selective expression of EBI1 during the maturation of DC, because maturation of DC is well characterized in epidermal LC (36). I-A+ cells sorted from freshly isolated epidermal cells and from 3-day cultured epidermal cells were used as immature LC and mature LC, respectively. By RT-PCR analyses, EBI1 was expressed in mature LC but not in immature LC (Fig. 1⇑A). This result is consistent with that of bone marrow-derived DC. Human EBI1 was originally reported to be an orphan GPCR in Burkitt’s lymphoma cells and is known to be induced in B cells infected with EBV and in lymphocytes after activation (24, 25, 26). When the expression was analyzed in macrophages, granulocytes, B cells, and T cells, EBI1 was expressed in B cells and T cells in accordance with the previous reports (24, 25, 26) (Fig. 1⇑B). Human monocyte-derived DC were used to examine whether the findings in mice could be extended to human DC, because mature monocyte-derived DC are well characterized in terms of the cell surface phenotypes and functions (30, 31). Monocytes cultured with GM-CSF and IL-4 are known to possess typical characters of immature DC with a high capacity for Ag uptake and low ability for naive T cell stimulation. Mature DC with high ability in naive T cell stimulation and low ability in Ag uptake can be induced by further stimulation of immature DC with MCM or LPS (30, 31). In fact, monocyte-derived DC obtained in this study following the previously reported culture methods resulted in a well accepted surface phenotype of HLA-DRlow, CD1ahigh, CD14−, CD25−, CD83−, and CD86− for immature DC and HLA-DRhigh, CD1alow, CD14−, CD25+, CD83+, and CD86high for mature DC (Fig. 2⇓). It was also confirmed that mature DC had 10- to 30-fold higher primary alloMLR-stimulating ability than immature DC (data not shown). Flow cytometric analysis of human DC. Highly purified CD14+ monocytes were cultured with GM-CSF and IL-4 for 6 days (immature DC) or were cultured with GM-CSF and IL-4 for 5 days and further stimulated with LPS (10 ng/ml) for 24 h (mature DC). The dot plots are the profile of forward and side scatter of immature DC (A) and mature DC (B). Histograms of isotype controls and six markers (isotype of each marker is shown in parentheses) are shown as gated cells (R1 region) indicated in dot plots. Solid lines and broken lines indicate mature DC and immature DC, respectively. Human EBI1 expression was analyzed by Northern blot analyses using immature DC and mature DC (stimulated with LPS) derived from highly purified monocytes (>95% pure by FACS analyses). As shown in Figure 3⇓A, we discovered that the expression of EBI1 was strikingly up-regulated after the maturation of DC. The results were confirmed by RT-PCR on RNA extracted from FACS-sorted cell population, including T cells, B cells, monocytes, granulocytes, immature DC, and mature DC (stimulated with MCM). EBI1 was expressed in T cells and was up-regulated in mature DC (Fig. 3⇓B). These results indicate that the expression of EBI1 is well induced during the maturation of human DC irrespective of the stimulation, i.e., MCM and LPS. A, Northern blot analyses of EBI1 transcripts in human DC derived from highly purified monocytes (top). DC obtained from two different donors were used. The same filter was deprobed and rehybridized with a β-actin probe to evaluate RNA loading (bottom). B, Analyses of EBI1 expression pattern by RT-PCR in human monocyte-derived DC and other leukocytes sorted by the mAb shown in parentheses. Lane 1, T cell (CD 3+); lane 2, B cell (CD 19+); lane 3, monocyte (CD 14+); lane 4, granulocyte (CD 66b+); lane 5, immature DC (HLA-DRlow/CD86−); lane 6, mature DC (HLA-DRhigh/CD86high). The β-actin specific primers were used as a control experiment. In the course of our findings on the expression of EBI1 in mature DC, human ELC/MIP-3β was cloned and identified as a ligand of EBI1, and EBI1 was designated as CCR7 (21). We tried to confirm whether the selective mRNA expression of EBI1/CCR7 in mature DC described above is correlated with the expression of functional receptors. Previous studies showed that CC chemokines induced a rapid, pertussis toxin (PTX)-sensitive and transient rise of [Ca2+]i in DC (6, 8). In this study, the effect of ELC/MIP-3β on [Ca2+]i changes in immature and mature DC was evaluated. The ELC/MIP-3β fused with Flag tag at the C terminus was expressed by COS 1 cells and purified homogeneity by anti-Flag mAb affinity chromatography (ELC/MIP-3β-Flag). As a control, mock (empty vector)-transfected supernatant was processed in the same way. A single band with the expected molecular size was detected by immunoblotting using anti-Flag mAb in the ELC/MIP-3β-Flag preparation, but not in mock control (data not shown). The purity and concentration of ELC/MIP-3β-Flag was estimated from silver staining. As shown in Figure 4⇓, A and B, ELC/MIP-3β-Flag induced a transient [Ca2+]i in mature DC with complete desensitization in a dose-dependent fashion (data not shown) but not in immature DC, while the mock control failed to induce a response in both types of DC. In addition, the chemokine response was inhibited by treatment with PTX (data not shown), indicating that the response induced by ELC/MIP-3β-Flag in mature DC was mediated through Gi protein-coupled receptors. These results demonstrate that mature DC, but not immature DC, selectively express functional EBI1/CCR7. As it has been reported that RANTES, MIP-1α, and MCP-3 induce responses in monocyte-derived DC cultured with GM-CSF and IL-4 (6, 8), we compared the activity of these chemokines in immature DC and mature DC. RANTES (50 ng/ml at final concentration) increased [Ca2+]i only in immature DC but not in mature DC (Fig. 4⇓C). The same results were obtained with MIP-1α and MCP-3 (data not shown). The fact that immature DC, which did not respond to ELC/MIP-3β-Flag, had the potential to respond to appropriate chemokines suggests that the lack of the response to ELC/MIP-3β-Flag in immature DC can be ascribed to the lack of the expression of EBI1/CCR7. These results indicate that chemokine response to DC varies with the degree of DC maturation. RANTES, MIP-1α, and MCP-3 react selectively with immature DC, while ELC/MIP-3β reacts selectively with mature DC. Mobilization of transient [Ca2+]i in human monocyte-derived DC stimulated with ELC/MIP-3β. Stimulating points with chemokines are indicated by arrows. The fluorescence changes of Fura-II-loaded immature and mature DC are shown relative ratio of fluorescence at 340/380 nm. A, mock control; B, ELC/MIP-3β (3%); C, RANTES (50 ng/ml). The chemotaxis of DC in response to ELC/MIP-3β-Flag was evaluated to further assess the expression of functional EBI1/CCR7. A transwell migration assay was employed, using the mixed population of immature and mature DC derived from highly purified human monocytes. The cells that migrated to the bottom of the chambers were stained with anti-CD86 mAb to distinguish immature and mature DC on a FACScan. ELC/MIP-3β-Flag, but not mock control, selectively induced the migration of mature DC in a dose-dependent manner, while RANTES selectively acted on immature DC (Fig. 5⇓). These results are completely consistent with those in Figure 4⇑. It was shown that EBI1/CCR7 mediates the migration of mature DC in response to ELC/MIP-3β-Flag. 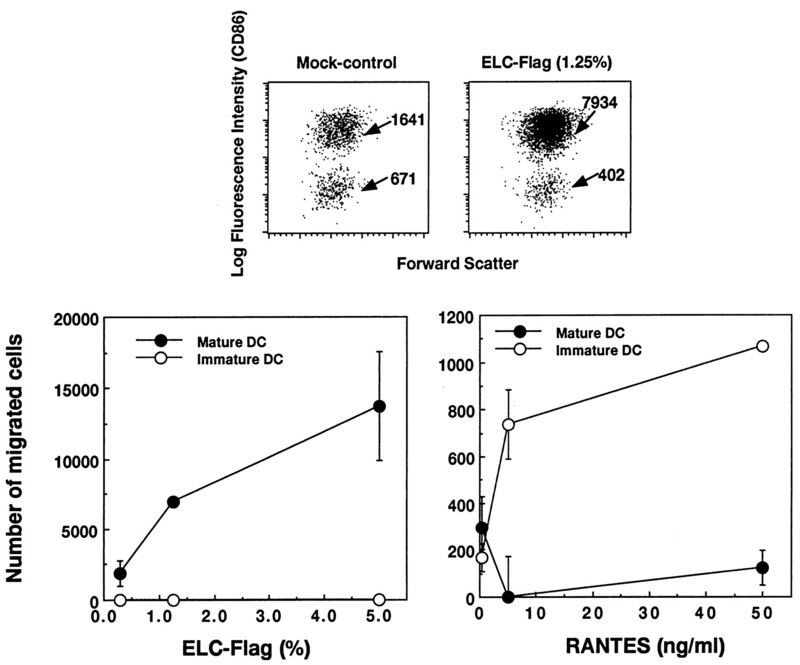 Directed migration of DC to ELC/MIP-3β-Flag and RANTES. 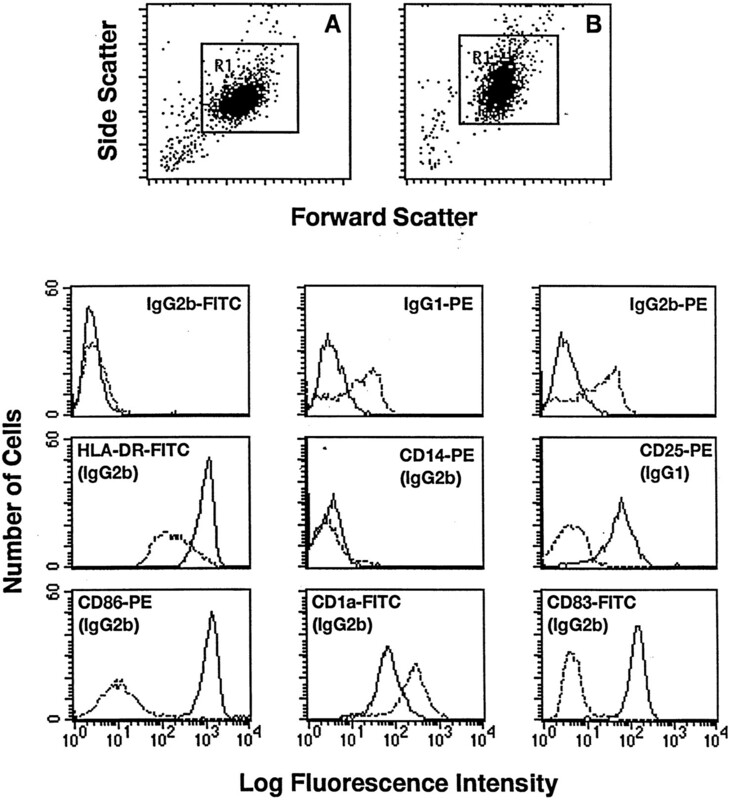 Human immature and mature DC (2 × 105 cells for each) derived from highly purified CD14+ cells were placed in the top chamber of a transwell migration assay. Graded concentrations of ELC/MIP-3β-Flag (left) and RANTES (right) were added to the bottom chamber. The cells migrating to the bottom chamber were recovered and stained with anti-CD86 mAb. The number of migrated CD86− cells and CD86+ cells was determined by differentially counting on FACScan as immature and mature DC, respectively. The typical dot plots of the mock control and ELC/MIP-3β-Flag (1.25%) are shown on the top. The arrows indicate distinctive populations of CD86− cells and CD86+ cells, and the numbers are the counted events. Each symbol in the bottom graphs represents the mean of triplicate culture with the SD bar. For each value, we subtracted spontaneous migration of immature DC or mature DC in the mock control. Values less than 0 were shown as 0. DC play a key role in the induction of immune responses. DC in nonlymphoid organs are immature cells with high capacities for Ag capture and processing, and yet low ability in T cell stimulation. Danger signals promote the maturation and migration of DC from nonlymphoid organs to lymphoid organs via lymphatics. Migratory DC found in afferent lymphatics are generally considered to be undergoing maturation, and DC reached in T cell area activate T cells in an Ag-specific manner (1, 2, 3, 5). Thus, migration of DC from the periphery to lymphoid organs is likely to be a critical step for the induction of immune responses, both in protective immunity and diseases. Importantly, this process is closely related to the maturation of DC (5). However, mechanisms that influence the migration of DC are poorly understood. Recently, it has been reported that human DC express a unique set of chemokine receptors potentially involved in the migration of DC (8). With these in mind, we have been interested in identifying chemokine receptors that are differentially expressed during the maturation of DC. In this study, we have discovered that EBI1, which has not been reported to be expressed in DC, is strikingly up-regulated upon the maturation of DC in three systems: 1) mouse bone marrow-derived DC, 2) mouse epidermal LC, and 3) human monocyte-derived DC (Figs. 1⇑ and 3⇑). This was demonstrated by RT-PCR with FACS-sorted cell population in all systems and by Northern blot analyses with highly purified human DC. Furthermore, a novel human CC chemokine, ELC/MIP-3β (21), which has been identified as the sole ligand of EBI1 (now designated as CCR7) so far tested, selectively induced transient [Ca2+]i and directional migration of mature DC but not of immature DC derived from human monocytes (Figs. 4⇑ and 5⇑). This indicates that functional EBI1/CCR7 is up-regulated along with the maturation of human DC. EBI1 was originally identified as an orphan putative chemokine receptor strongly up-regulated in Burkitt’s lymphoma cells after infection with EBV (24). It is also reported that EBI1 is expressed in various lymphoid tissues (24, 25, 26) in which mature DC reside and to which Ag-loaded DC home. Although, human EBI1 has been shown to be expressed in T cells from PBMC as well as in mature DC by RT-PCR, ELC/MIP-3β failed to induce transient [Ca2+]i in lymphoid cells (CD14+ cell-depleted PBMC) (data not shown). It is likely that the signal detected by RT-PCR in T cells derived from a minor population of activated T cells in peripheral blood, because EBI1 is also reported to be expressed in activated T cells and B cells but not in resting lymphocytes (26). In contrast to ELC/MIP-3β, it is interesting to note that CC chemokines such as MIP-1α, MCP-3, and RANTES selectively induced transient [Ca2+]i increases in immature DC but not in mature DC (Fig. 4⇑). This is consistent with the previous report showing that DC derived from monocytes cultured with GM-CSF and IL-4 or IL-13 (6, 8), i.e., immature DC in this study, respond to a distinct set of chemokines, including these three chemokines. Rat respiratory tract DC, which can respond to RANTES, have been shown to be recruited into airway epithelium during the inflammatory response (37). It seems likely that MIP-1α, MCP-3, and RANTES are involved in the migration of immature DC to peripheral inflammatory sites, while ELC/MIP-3β is involved in the migration of Ag-loaded DC from the periphery, where the expression of EBI1/CCR7 are up-regulated by inflammatory stimuli to lymphoid tissues. In analogy, EBI1/CCR7 might be involved in the induction phase of delayed-type hypersensitivity response. Previous findings showing that expression of ELC/MIP-3β is mainly restricted to lymphoid organs (21, 27) support this idea. Studies in experimental animals have shown that LPS, GM-CSF, IL-1, and TNF-α are involved in DC migration from nonlymphoid tissues to lymphoid organs (38, 39, 40). As all these signals are also involved in DC maturation, the possibility that the induction of EBI1/CCR7 on DC should be considered as one of the mechanisms. Recently, CCR6 has been reported to be expressed in human CD34+ progenitor-derived DC and lung DC, but not in monocyte-derived DC (41, 42). Furthermore, CCR6 is particularly expressed in one of the two intermediates derived from CD34+ progenitor cells, i.e., CD1a+-derived Langerhans-like cells but not CD14+-derived dermal/interstitial-like DC (42). In this sense, CCR6 expression seems to vary with the subset of DC. In contrast, CCR7 is expressed on three different tissues of mature DC. The expression of CCR6 is down-regulated in CD34+ progenitor-derived DC upon stimulation with PMA and ionomycin, whereas the expression of CCR7 is up-regulated upon maturation of DC (42). Similarly, CCR7 is up-regulated upon T cell activation, while CCR6 is down-regulated (42). There are also several similarities between the two receptors. It is reported that CCR6 is most closely related to CCR7 in terms of phylogenetic relationship among known chemokine receptors and a number of orphan receptors (41). Furthermore, the ligands of these receptors, LARK/MIP-3α and ELC/MIP-3β, share features that are distinct among most CC chemokines (21, 27). Most CC chemokines bind to more than one chemokine receptor, while LARK/MIP-3α and ELC/MIP-3β are the sole ligands so far tested for their respective receptors. Most human CC chemokine genes are clustered on chromosome 17q11.2, while the genes of LARK/MIP-3α and ELC/MIP-3β are located on chromosome 2q33-37 and 9p13, respectively. Collectively, it is tempting to speculate that CCR6 and CCR7 might have evolved in close relation to control migration of DC and lymphocytes by their reciprocal expression, depending on cell maturation and activation status. In summary, we have discovered that the expression of EBI1/CCR7 is strikingly up-regulated upon the maturation of DC and that ELC/MIP-3β, the ligand of EBI1/CCR7, selectively induces the directional migration of mature DC. It is proposed that EBI1/CCR7 plays a crucial role in DC migration, especially from periphery to lymphoid organs. EBI1/CCR7 as a DC chemokine receptor may be a potential target of immune intervention in graft rejection, allergy, and autoimmune diseases. Note added in proof: After acceptance of this manuscript, Dieu et al. 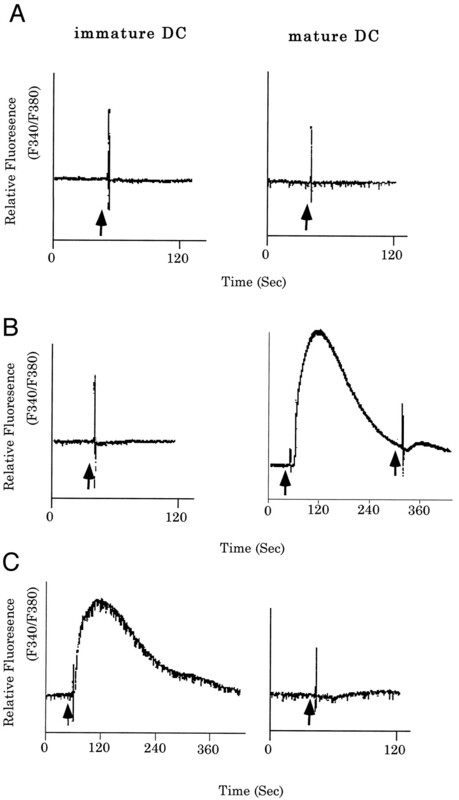 (43) and Sozzani et al. (44) reported the expression of CCR7 along with the maturation of DC and their responsiveness to ELC/MIP-3β. We thank Drs. Toshifumi Mikayama and Hiroshi Okazaki for their encouragement and valuable discussion and Drs. Masatake Osawa and Terumi Hirano for their assistance with excellent cell-sorting experiments. ↵2 Abbreviations used in this paper: DC, dendritic cells; [Ca2+]i, intracellular free calcium; GM, granulocyte/macrophage; GPCR, G protein-coupled receptors; LC, Langerhans cells; MIP, macrophage inflammatory protein; MCM, monocyte conditioned medium; MCP, monocyte chemotactic protein; PTX, pertussis toxin.